The D23 Expo is shaping up to be quite the beast, as Disney just announced earlier today that Pixar will have a huge presence at the show. We had already heard that there would be some cool exclusive collectibles available. Now, we have some more details and images on the Toy Story and Cars 2 exclusives that you can expect to see. From the Toy Story series, there will be a marionette Woody that can be moved around as if he were a puppet (think Toy Story 2) and a flocked Lotso POP! Vinyl figure. 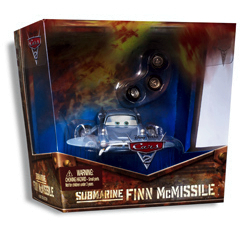 From Cars 2, an exclusive Submarine Finn McMissile will be on sale. Read on for the images and the details! In Toy Story 2, Woody finds out that before he was ever one of Andy’s favorite toys, he was the star of his own TV series. Beloved by millions of children, Woody’s Roundup followed the Wild West adventures of Sheriff Woody and his co-stars Bullseye the horse, Jessie the cowgirl, and Stinky Pete the Prospector. 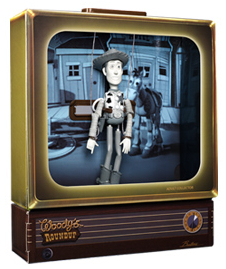 Now you can commemorate Woody’s history with the D23 exclusive Woody’s Roundup! Just like in the TV show, we feature a marionette Woody in black and white that you can move like a puppet. Also included are 3 interchangeable backgrounds showing key scenes from the show. And as a final nod to the series, the package is styled like an old-fashioned television set. British Master Spy Finn McMissile has the gadgets to prepare for any mission– even if it’s underwater! Commemorate the iconic scene from Cars 2 when Finn McMissile transforms himself into an underwater Submarine to escape Professor Z and his Minions. This D23 exclusive features a 1:55th scale, die cast Submarine Finn McMissile with double ransberg paint for an extra special look. The diorama package brings the underwater scene to life with Finn in his submarine mode and his ejected tires floating to the surface. The Fire Wire brings us the news that Disney will have a Flocked Lotso figure (meaning it will have a “peach fuzz” feel to it). 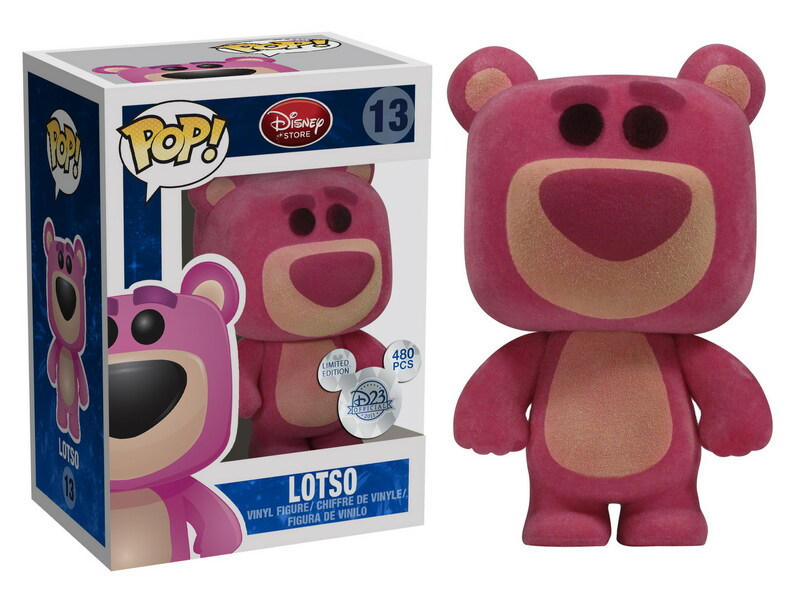 The Lotso figure is a variant of the 13th figure in the Disney POP! Vinyl series. There is a limited edition of only 480 pieces and it will retail for $15.00. I am sure we will be seeing more Pixar collectibles that will be available for sale at D23. Stay tuned for more updates!